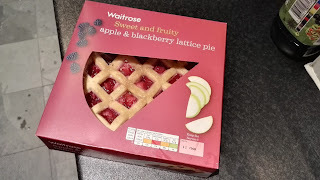 I re-homed this sweet dessert pie from my local Waitrose for the sweet, fruity price of £2.99. I won't eat it all in one go, as the pie is large and sufficient for approximately 3-4 servings. 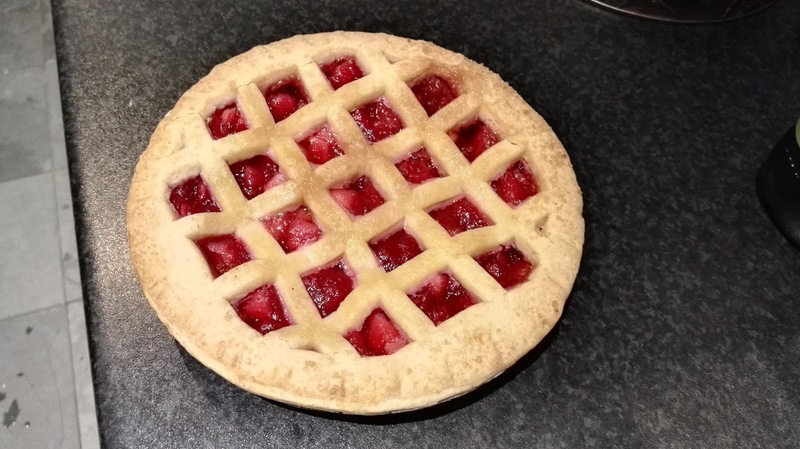 The first thing you'll note (and the clue is in the name) is that this is a lattice pie. 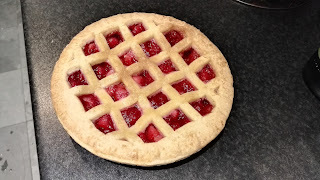 While I appreciate that the lattice serves a purpose - to allow the juices in the fruit filling to evaporate and therefore help the filling to caramelise - I don't believe it can substitute for the joy of a fully lidded pie. I'll continue with the review, but let it be known that I am not happy with the state of the lid. 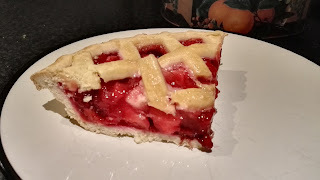 You'll also note how red the filling looks: you'd be forgiven for thinking this is an apple and strawberry pie! Cross-sectionally, the pie is reasonably well filled and has no air gap (well, how could it?! There's barely any lid!). The pie is a bit pale, but that could be because I have chosen not to bake it but to eat it cold straight from the fridge. When it comes to eating pies, I have no time to waste heating them up. Upon tucking in, I found the chunks of apple to be slightly too hard for my liking. Again, this could be because I ate the pie cold straight from the fridge. If I had baked the pie for the suggested 25-30 minutes at 160 degrees Celsius in a fan oven, perhaps the apple chunks would have softened to a more palatable consistency. The pastry was tasty and had a pleasurable texture. The slight chew of the pastry complemented the crunch of the fruit. This was a refreshing hit of texture that contrasted with my regular experiences of eating a pie, where the filling often provides the chew and the pastry the crunch. Perhaps this is why I find eating cold fruit pies such an exhilarating experience: the departure from the norms of gastronomic experience provides a euphoric rush of adrenaline. There's not much more that can be said about this fairly inoffensive fruit pie with a lattice lid. The filling was average and not likely to cause much upset. Heated up, the pastry might have crisped a little and the apple softened, so I would perhaps recommend doing that next time. There will be a next time, because happily I have a few more portions of this pie still left to eat. This pie won't win any awards, but it will gain a fairly good position in our pie rankings. The crucial factor though is that I'd buy it again, and I'd recommend you do the same if you get the chance. Haha good stuff! I'm sure you were looking for pie really! Lol same happened to me when i was searching Blackberry phones.